Earth Aware Editions, 9781683830825, 318pp. Award-winning photographer Art Wolfe has worked on every continent and in hundreds of locations over his forty-year career. His stunning images interpret and record the world’s fast-disappearing natural treasures and are a lasting inspiration to those who seek to preserve them. Gregory McNamee is the author or editor of thirty-five books and is a consultant and contributing editor to the Encyclopaedia Britannica and its blog. Wade Davis is a critically acclaimed, internationally best-selling author and anthropologist with a PhD in ethnobotany. Davis’s many books include The Serpent and the Rainbow, One River, The Wayfinders, and Into the Silence. Between 1999 and 2013, Davis served as explorer-in-residence at the National Geographic Society, and he is currently professor of anthropology and the LEEF Chair in Cultures and Ecosystems at Risk at the University of British Columbia. 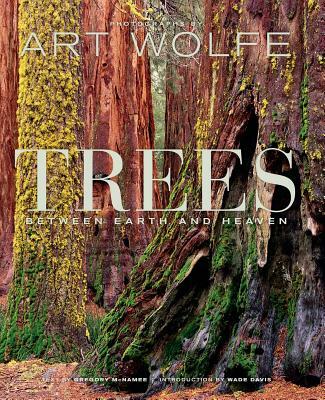 "Trees is an example of Wolfe’s compositional mastery...The result of Wolfe’s work is a stunning collection of color photographs lending credence to that certain sacredness that exists in the forest and nowhere else." "Only one word can describe this brilliantly illustrated tome – tree-mendous."